I am now enrolled in my second set of Pilates classes at the LifeStudio of Life Time Fitness; I’m feeling stronger and learning something new with each class. Please note: the following is of my own experiences. Pilates may or not be right for you. Check with your own personal trainer and/or doctor before trying any new fitness adventure. To perform this, begin stretched in the side plank. With all movement coming from the lower abdominals, crunch them in as your hips rise and feet come in toward you. At the same time, swing the arm down and under as you “thread” across your core. Hard to perfect . . . but feels great once you do! “Contrology” – that’s what Pam Barich is teaching us in class!! Proper Pilates technique means the body must remain in control. Movement should not cause the body to misalign, shake, or protude. That is easier said than done; but, Pam is showing us how to build that strong core – the Pilates powerhouse – that keeps those movements in check. The core is what connects the band of strength across our upper bodies to the band of strength across our lower bodies. A strong core provides for the safe conduct of strain along our spines between our arms and legs. When we are connected in this basic Pilates manner, the muscles that support the spine are actually strengthened by the movement. Pam uses fun, easy-to-remember techniques to help us progress through the movements. For instance, when prompting us to lie in the preparatory Pilates position (shoulders pressed back on the reformer, lower back lifted and lower abdominals tucked in), she reminds us “not to kill the ladybug”. . . meaning hold the core tight that it doesn’t rest on the mat. Or she might say “balance that glass of wine” so it doesn’t spill . . . meaning tighten those abs so that they are hard and flat as possible. Fun!! My lower, inner abs never worked so hard! You just can’t get this kind of workout with strength training alone. To perform this, first position yourself into a bridge. Next, raise one leg and hold, being sure not to let your glutes drop. Along with progressing through these movements, Pam challenges us with new exercises during each and every class. 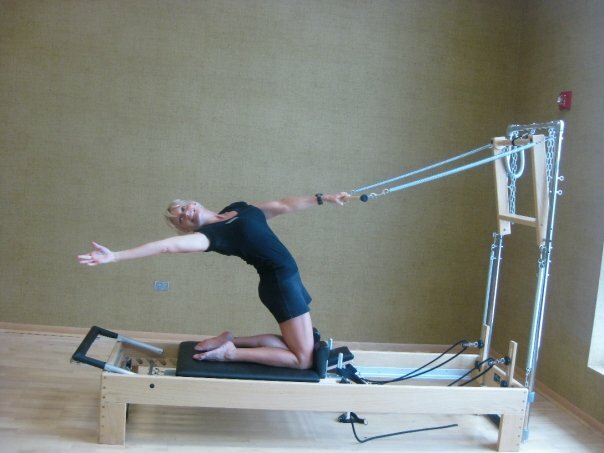 It amazes me how much varied stretching, pushing, pulling and strength movements that can be achieved on the Reformer. Whether it’s leg circles, the hundred, extended arabesques . . .it’s impossible to get bored or tired. Pam’s repertoire includes classic Pilates positions along with her own productive inventions. What’s great about Pam Barich’s classes from others is one never know what challenges and unique, fun sets Pam is going to surprise us with. Students get the best of both worlds with Pam’s instructions: continued progressions of the same movement for growth coupled with unique twists for challenges. Into the 7th week of classes, Grading Girl gives Pam Barich at Life Time Fitness an A+ for innovative exercise that provides more results in half the time. Men Benefit from Pilates Too! Men, women, people of all ages and levels can benefit from a Pilates class. In fact, a 50 year old gentleman just joined my class this past Tuesday. He has some pains in his back and wishes to strenthen his legs. After just one session, he exclaimed how much his muscles were shaking yet instantly felt less painful from when he walked into class. Pilates is rehabilitation, it’s strength training, and it’s mental release all in one. I walk out of class feeling like I’m floating – I’m that relaxed and limber after the stretches, pulls and balances we concentrate on. Thanks for the update on your classes. It truly is amazing what Pilates can do for a person. I am continuing my training with Pam and I can’t say enough about what she has done for me. I am stronger and more flexible than I have been in years. I’m glad you are enjoying your workouts. I certainly agree that Pam deserves an A+! I am looking forward to your next post. Thank you, Ron, for your input! Pam is going to be gone for a couple of weeks. I’ll be posting my next progression at the beginning of November.